As we reported last month, U.S. brokerages sold 6 percent more boats in 2013 than in 2012 at an aggregate price that was 21 percent higher — $3.94 billion. YachtWorld member brokerages said they helped 31,451 boats change hands during the year. This month we look at sales regionally, and the results show that brokers in some parts of the country made more significant sales gains than those in others. 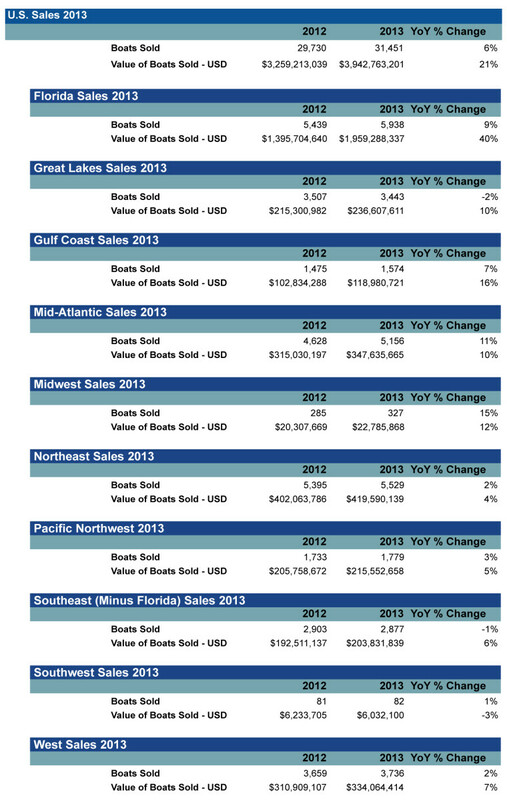 Florida brokerages led the nation in volume with 5,938 boats sold, just ahead of the Northeast and the Mid-Atlantic. On the basis of dollar volume, however, the aggregate price paid in Florida increased 40 percent, to $1.96 billion, very close to half the value of all boats sold nationally. It should be noted that nearly all of the approximately $500 million increase in Florida was the result of sales of boats larger than 80 feet. At the same time, the 499 additional boats that were sold in Florida during the year were mostly 35 feet and shorter. On a percentage basis, the Mid-Atlantic and Midwest made double-digit gains in unit sales. The weakest areas were the Great Lakes region and the Southeast, apart from Florida. On a value basis, besides Florida, the biggest gains on a percentage basis were in the Gulf Coast and Midwest regions, both in double digits. Next month we’ll resume reporting in more detail on monthly sales.